HRDQ-U is a learning community for trainers and facilitators, coaches and consultants, organization development professionals, managers, supervisors and leaders. It is a leader in bringing exciting content to its followers through live and on-demand webinars from subject matter experts and thought leaders that explore new ideas, share industry insight, and improve people skills in the workplace. To learn more about the Respect on the Go toolkits and our Team Civility Booster program, click here. 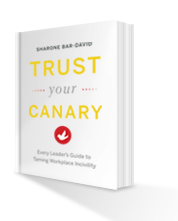 For information on Sharone Bar-David’s book, Trust Your Canary: Every Leader’s Guide to Taming Workplace Incivility, click here. ← Bar-David Consulting Expertise Featured in Safe Supervisor Magazine.